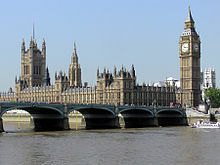 The legislative branch of the UK Government comprising the House of Commons and the House of Lords, the Parliament of the United Kingdom of Great Britain and Northern Ireland is the supreme legislative body in the United Kingdom and British overseas territories. It alone has parliamentary sovereignty, conferring it ultimate power over all other political bodies in the UK and its territories. At its head is the Sovereign, Queen Elizabeth II.